Heath Nash and his crew of artisans are bridging social and economic divides with their novel creations. If anyone can turn plastic milk bottles into intricate lampshades, it’s Heath Nash. He made a name for himself on the design scene with his ability to transform waste into objects of beauty. But as his craft gained recognition, Nash realised it was to the exclusion of local artisans. 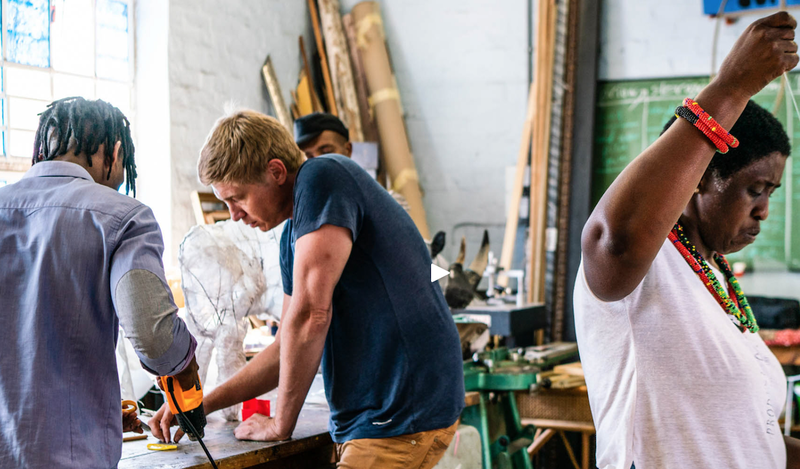 For decades, South Africans have upcycled trash to use in their everyday lives. Now, their ingenuity returns to the forefront of the art world. At Guga S’thebe, a cultural centre in Langa, Cape Town, creators gather to perfect their craft. In 2016, Nash founded Our Workshop at the hub to bridge social and economic divides. “In Cape Town there are very few places for people from different racial groups to hang out,” Nash says. But here, designers, artists and everyone in between can connect and create. “Because we’re working together and everyone’s exchanging skills, there’s a great deal of growth happening,” Nash explains. For many, being creative comes naturally. But the opportunity to turn their craft into a profession isn’t as accessible. Nash’s NGO gives people the chance to sell their products and establish themselves. This year, the initiative received the Design with Purpose Award from the Design Foundation. Previously unrecognised artisans are pioneering a new culture. Beyond the confines of identity, what matters here is the desire to create. For this and other Beautiful News stories, click here.